Our punch presses range in size from 45 to 300 tons. 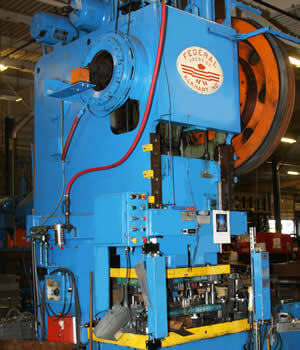 Cannon Industries offers a range of production stamping and steel forming services. Cannon has a wide range of punch presses ranging in size from 45 to 300 tons. Using this equipment, we are able to produce high quality, high production products at a savings to our customers. From special small order to full production requests, our Metal Stamping department can complete your job with the utmost accuracy in the most cost effective manner possible. Using state of the art equipment: horizontal lathes, punch presses, mills, and grinders, Cannon’s Metal Stamping Department offers production stamping and steel forming services. Whether we’re punching one hundred parts or one hundred thousand parts, you know you’re getting production stamping that fits your tight tolerances and high standards. Our wide range of presses offer cushions, coil underwire and straighteners to meet whatever challenges you bring to our operation. Our punch presses are augmented by horizontal lathes, mills, and grinders to serve all of your metal stamping and steel forming needs. No job is too large or too small for our expert operators and new, modern equipment. We make the commitment to you to deliver on time and on budget.